Whereas China slashes US sanctions on a Chinese company, the Zhuhai Zhenrong Corp, US warns to impose further sanctions on Chinese state-run oil giants. US Treasury Secretary Timothy Geithner came away empty handed from Beijing, which refused to bow to U.S. pressure to add its economic might in the campaign to isolate Iran; in return, United States imposed sanctions on the Zhuhai Zhenrong Corp, a state-run oil firm for exporting petroleum products to Iran, barring it from doing business in the United States. 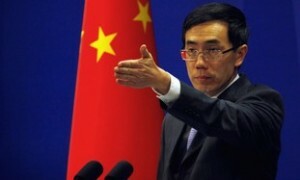 In response to Washington’s decision to impose sanctions on this company for trading with Iranian firms, the Chinese Foreign Ministry spokesman Liu Weimin said that “We have repeatedly stated that China has normal and transparent energy cooperation with Iran, and that does not violate Security Council resolutions” so Beijing will maintain its normal cooperation with Tehran in the areas of energy and trade and US sanctions won’t hinder Iran-China trade. “Imposing sanctions on a Chinese company based on a domestic (US) law is totally unreasonable, and does not conform to the spirit or content of UN Security Council resolutions about the Iran nuclear issue,” Liu Weimin added. Analysts have said the US move was largely symbolic, given that China’s Zhuhai Zhenrong was unlikely to have much US business, but that it sent a warning to Beijing and its state-run oil giants such as China National Petroleum Corp (CNPC), China Petroleum and Chemical Corp (Sinopec Corp) and China National Offshore Oil Corp. These companies have invested billions of dollars in the US energy sector, and are much more exposed to the impact of potential sanctions. Are Gulf States, US Accomplice?